Briggs and Stratton is the established name in power generation, with over 100 years of experience manufacturing from their Milwaukee, Wisconsin headquarters. The generators they make are among the finest in the world, backed by the largest service network in the industry, with over 2,500 authorized service providers. For any issue or need, there is an American based Answer Care representative at the other end of their customer support line. They also have a Customer Support Portal to get immediate answers to any question. Briggs and Stratton home standby generators provide the ultimate in premium protection. Their FORTRESS™ line of standby generator systems is backed by the industry’s longest parts, labor and travel 6-year limited warranty*. 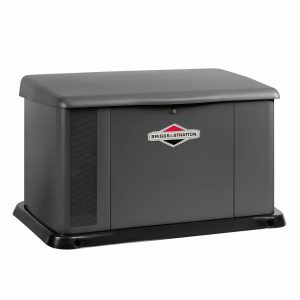 The Briggs and Stratton 10kW Fortress Standby Generator System is perfect or small to medium sized homes. This makes backup power more affordable than ever, with this smaller, sleeker 10 kW1 generator system. The Symphony® II Power Management System uses the latest technology to allow a smaller home generator system to meet all your needs and save you money in the process.The 10kW Briggs and Stratton Fortress generator is designed to keep your critical circuits going during an outage, reliably, consistently and effortlessly.They even come standard with an oil warmer to ensure your generator starts every time, even in the chill of winter. Every Briggs and Stratton has a commercial-grade Vanguard™ engine. From their smallest generator to the 20kW (their most popular model) these engines provide powerful performance when it matters most. Briggs and Stratton generators haveenclosures made from automotive-grade Galvanneal steel to resist rust. Designed to weather the elements, the Briggs and Stratton advanced powder coat paint process results in years of protection against chips and abrasions. Briggs and Stratton machines are built with components from the top manufacturers in the generator industry. They have partnered with ASCO to develop high grade automatic transfer switches. When the power goes out, their units go on with the switch to generator power seamless. Briggs and Stratton line of generators can be customized to match the extreme conditions they might have to operate in. They offer Cold Weather Kits to ensure smooth starting and operation in any winter weather. Simple, easy to use Maintenance Kits are available to the “Do It Yourselfers.” For Remote Monitoring, Briggs and Stratton generators offer Basic Wireless Monitoring and an enhanced upgrade to their Infohub, to connect generators withhandheld devices, laptops and desktop computers. Briggs and Stratton generators are designed for efficient operation, durability and ease of maintenance. For exceptional reliability, durability and performance look to Briggs and Stratton for your generator needs.